Although he won, Buescher still has some work to do to make the Chase for the NASCAR Sprint Cup. Last year’s NASCAR XFINITY Series champion sits 31st in the points standings, six points behind David Ragan for 30th. Coincidentally, Ragan was the last driver to win for Buescher’s Front Row Motorsports team – 118 races ago at Talladega. Also, Ragan helped Buescher get his career off the ground by setting him up with living arrangements, signing him to his Legends car team as a development driver and connecting him with Roush Fenway Racing. Last weekend Sunoco Rookies won all three NASCAR national series races for the first time in history – Buescher (NASCAR Sprint Cup Series), 23, Erik Jones (NASCAR XFINITY Series), 20, and William Byron (NASCAR Camping World Truck Series), 18. Their average age is 20.33. Joey Logano showed he can race on any type of track last year when he swept the Watkins Glen International NASCAR Sprint Cup Series and XFINITY Series contests. In addition to his Sprint Cup Series road-course win last year, he also visited Victory Lane at a short track (Bristol), two restrictor-plate tracks (Daytona and Talladega) and two 1.5-mile ovals. He returns to Watkins Glen – which features a new racing surface this season – with his sights set on two more victories. Logano has finished seventh or better in four of his last five starts at Watkins Glen: fifth in 2011, 32nd in 2012, seventh in 2013, sixth in 2014 and first in 2015. In his last two starts at NASCAR’s other road course – Sonoma Raceway – Logano has finished fifth (2015) and third (2016). The Middletown, Connecticut native has exhibited good form lately with seven top 10s in his last nine starts, including five top fives. On the season, Logano has one win, eight top-five and 13 top-10 finishes in 21 starts. Allmendinger crashed the Chase with a win at Watkins Glen International in 2014 and will try to do it again in 2016 with a visit to Victory Lane in Sunday’s Cheez-It 355 at The Glen. The road-course ace realizes he won’t have a better opportunity to take a checkered flag the rest of the season. In seven career starts at Watkins Glen International, Allmendinger owns one win, two top fives, four top 10s and an average finish of 10.1. Tony Stewart owns the track wins record at Watkins Glen International with five victories. He hasn’t crossed the finish line first there since 2009, but will attempt to add his sixth track win in Sunday’s Cheez-It 355 at The Glen. In addition to his five wins, Stewart boasts seven top-two, and 10 top-10 finishes at the Central New York road course. From 2002-09, he finished worse than second at Watkins Glen International only once (11th in 2003). The rejuvenated Stewart has more top fives and one less top 10 through 13 starts this year than in his last two seasons combined. He has four top-five finishes in his last six races. Jeff Gordon will make his 800th career start – and his third consecutive race in place of Dale Earnhardt Jr. – in Sunday’s Cheez-It 355 at The Glen. Gordon will be the ninth driver to make his 800th start, joining: Richard Petty (1,185), Ricky Rudd (906), Terry Labonte (890), Dave Marcis (883), Mark Martin (882), Kyle Petty (829), Bill Elliott (828) and Darrell Waltrip (809). A win on Sunday would tie Gordon with Tony Stewart for the Watkins Glen track record for victories with five. In 23 starts at the Central New York road course, he claims four wins, six top fives and nine top 10s. The Hendrick Motorsports driver is NASCAR’s all-time leader in road-course wins with nine. Following Watkins Glen, Gordon will make at least one more start for Earnhardt, at Bristol. Gordon has placed 13th at Indianapolis and 27th at Pocono as a sub for Earnhardt the last two races. Matt Kenseth will make his 600th career start in Sunday’s Cheez-It 355 at The Glen. For his career, Kenseth boasts 38 wins (tied for 19th in NASCAR Sprint Cup Series history), 167 top fives, 299 top 10s, 17 poles and 10,851 laps led. At Watkins Glen, Kenseth has one top five and six top 10s in 16 starts. He did finish fourth at Watkins Glen last year and ninth in 2014, but has only led three laps there. This season, Kenseth is one of five drivers with multiple wins (Kyle Busch, Brad Keselowski, Carl Edwards and Jimmie Johnson). He has two wins, four top fives, nine top 10s and a 14.1 average finish. NASCAR Sprint Cup Series, Etc. Though their spots were all but assured as is because of a race win, five drivers clinched spots in the Chase for the NASCAR Sprint Cup at Pocono. They are Kevin Harvick, Kurt Busch, Joey Logano, Martin Truex Jr. and Denny Hamlin. Solid consistency has landed JR Motorsport’s Elliott Sadler the NASCAR XFINITY Series points lead, following his third-place finish at Iowa this past weekend. Sadler now also leads all championship contenders in top-10 finishes with 16, and holds a 19-point lead over second-place Daniel Suarez. Joe Gibbs Racing’s Suarez was uncharacteristically sidelined due to engine issues this past weekend at Iowa. Advantageously, Sadler made the most of his opportunity, slicing up a difference of 14 points, and driving a 19-point stake between the two. It was Suarez’s second DNF of the season; while Sadler has yet to not finish a race. In 19 starts this season, Sadler has posted one win (Talladega) and six top fives. His average finish of 8.1 this season is the best among the series title contenders. Looking ahead, the JR Motorsport veteran Sadler has made seven starts at Watkins Glen, claiming one top five, four top 10s and an average finish of 11.3. Sadler has finished in the top 10 in his last three starts at WGI. Joe Gibbs Racing’s Sunoco Rookie of the Year standout Erik Jones has become the first rookie to win three races (Bristol-1, Dover-1 and Iowa-2) since 2014 NASCAR XFINITY Series champion/Sunoco Rookie of the Year Chase Elliott, and Jones is on pace to eclipse the all-time series rookie wins’ record of five set by Greg Biffle (2001), Kyle Busch (2004) and Carl Edwards (2005). But his record-crushing prowess doesn’t end there, Jones already broke his teammate Kyle Busch’s series record for the most poles by a rookie (five) when he claimed his sixth at Iowa back in June. Jones has also set his sights on the series top fives rookie record, as he has already saddled 11 top fives this season. The drivers with the most NASCAR XFINITY Series rookie top fives are Greg Biffle (2001), Kyle Busch (2004), Austin Dillon (2012) and Chase Elliott (2014), who all registered 16. Jones might sit fourth in points at the moment, but he is seeded first in the NASCAR XFINITY Series Chase due to the bonus points he has accrued with his three victories. Now up to nine bonus points, three points per victory, he is already a fender ahead of his competition when the inaugural Chase fires up at Kentucky Speedway on Sept. 24. Jones will make his series track debut this weekend at Watkins Glen International Saturday on its brand new surface. No other car number is more synonymous with winning in the NASCAR XFINITY Series than Roush Fenway Racing’s No. 60 Ford. The RFR team has 94 series victories to its credit, and this weekend, Trevor Bayne, who hasn’t made a series start since 2014, will get the privilege to try and make it 95 wins at Watkins Glen in the Zippo 200 at the Glen. Roush Fenway Racing has fielded some of the sport’s greatest winners inside the No. 60. Mark Martin poured the foundation that built the house of victories that is the No. 60 Ford’s series record with his 39 wins. Greg Biffle took the reins after Martin and added another 14 checkered flags. Following Biffle, it was Carl Edwards turn to drive the 60 and during his stint behind the wheel he amassed 38 victories. And last but not least, Chris Buescher, the 2016 NASCAR Sprint Cup Series Sunoco Rookie of the Year candidate who won his first series race Monday at Pocono, got his start in the NASCAR XFINITY Series No. 60 RFR Ford. Buescher also added to the team’s legacy with three wins. Carl Edwards drove the Roush Fenway Racing No. 60 to victory at Watkins Glen International in 2012. This weekend, Bayne will be led by crew chief Drew Blickensderfer. Bayne has made four series starts at WGI, posting a best finish of ninth. Watkins Glen can attract an assortment of different drivers wanting to compete on the famed curves. Not even counting the usual cast of NASCAR XFINITY Series drivers, fans will get to see several new drivers attempting to make the race like Nicolas Hammann, Scott Heckert and John Jackson. Hammann is a road course specialist who mastered his skills winning karting championships on the hills of his home track Road America in Elkhart Lake, Wisconsin. When he graduated to cars, he won the GT Academy that granted him access to training oversees, before returning to the United States to compete in one of the highest levels of sports car racing in the US, the IMSA Continental Tire SportsCar Challenge in the Doran Racing Nissan 370Z. This weekend, the 23 year-old Hammann, will attempt to make his series debut in the No. 74 Dodge for car owner Mike Harmon. Scott Heckert, is a 21 year-old from Ridgefield, Connecticut, who spent 2015 driving the No. 34 Project Lifesaver Chevrolet for the HScott Motorsports with Justin Marks team in the NASCAR K&N Pro Series East. Like Hammann, Heckert got his start in racing through karting and won titles in the Norwalk Karting Association and the highly competitive World Karting Association racing 4 stroke sprint karts in the Mid-Atlantic Region and National level. Heckert made his series debut earlier this season for car owner BJ McLeod at New Hampshire, starting 35th and racing up to a 26th-place finish. This weekend, Heckert will drive for Rick Ware in the No. 15 Ford. John Jackson, from Carluke, Scotland is just the second driver from the United Kingdom to compete in the NASCAR XFINITY Series joining fellow Scotsman Dario Franchitti from Edinburgh. Jackson has made four starts this season for car owner Carl Long posting a best finish of 32nd at Talladega. This weekend will be Jackson’s series track debut at WGI. NASCAR In New York: NASCAR has held 98 national series events among 15 tracks in the state of New York (NSCS 71 races, NXS 22 races and NCWTS five races). 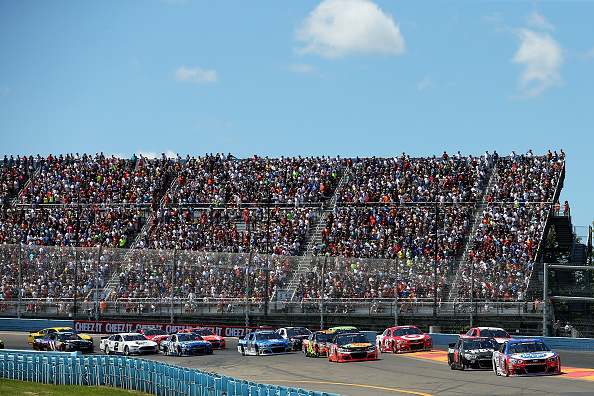 Watkins Glen International has held the most NASCAR events in New York with 60 (NSCS 33, NXS 22, NCWTS 5). The very first NASCAR national series race held in the state of New York was on Sept. 18, 1949 at Hamburg Speedway in Hamburg, New York. The race was won by Jack White. New York Drivers In NASCAR: There have been 185 drivers who have made at least one start in a NASCAR national series with their home state recorded as New York. The first New Yorker to compete in a NASCAR national series was Al Keller from Buffalo, New York at Langhorne Speedway on Sept. 11, 1949. He started 22nd and finished eighth in a Ford. The first New York driver to win in a NASCAR national series was Jack White from Lockport, New York, at Hamburg Speedway on Sept. 18, 1949 in a Lincoln. Of the 185 NASCAR drivers with their home state recorded as New York, 21 have competed in the NASCAR XFINITY Series, led by Todd Bodine with 334 career starts. Bodine is from Chemung, New York and he also has the most series wins of the New York NASCAR drivers with 15. Thirteen WGI Newbies: That’s right, 13 drivers will be attempting to make their NASCAR XFINITY Series track-debuts this weekend at Watkins Glen – Erik Jones, Brandan Jones, Ray Black Jr., Mario Gosselin, Spencer Gallagher, Nicolas Hammann, Scott Heckert, John Jackson, BJ McLeod, Brennan Poole, Ryan Preece, Garrett Smithley and Cody Ware. Sprint Cup Drivers Entered At WGI: Six NASCAR Sprint Cup Series drivers are taking advantage of the extra track time on the new surface by entering this weekend’s Zippo 200 at the Glen – Kyle Busch, Brad Keselowski, Joey Logano, Paul Menard, Kyle Larson, and Trevor Bayne. With his visit to Victory Lane at Pocono, William Byron set the NASCAR Camping World Truck Series Sunoco Rookie wins record with five triumphs this season. The mark was previously held by Kurt Busch, who won four races for Roush Racing in 2000. Byron’s five wins lead the NASCAR Camping World Truck Series. Two-race winner Matt Crafton is the only other driver in the series with multiple victories. Byron also paces the series in driver rating (112.5), along with laps led (402), and is tied with Johnny Sauter for first in the series with six top fives. The No. 9 Kyle Busch Motorsports driver ranks second in the series in average running position (7.0) and fastest laps run (202). The 18-year-old Charlotte native has won four of the last six NASCAR Camping World Truck Series races. He takes the track again next, along with the rest of the NASCAR Camping World Truck Series, in the UNOH 200 at Bristol Motor Speedway on Wednesday, Aug. 16 (8:30 p.m. ET on FS1). Cameron Hayley tied his career-best finish with a runner-up showing at Pocono. The result moved him into the final spot for the NASCAR Camping World Truck Series Chase with four races left until the playoffs. Hayley is tied with Ben Kennedy in points, but holds the tie breaker because his season-high runner-up finish is better than Kennedy’s top showing of seventh at Iowa and Pocono. The Calgary, Alberta, Canada native previously finished runner-up at Atlanta in the second race of the season. So far in his sophomore Camping World Truck Series campaign, he has three top fives and six top 10s. Hayley’s ThorSport Racing teammate Rico Abreu placed sixth – his second top-10 finish of the season after producing a third-place result in the last contest at Eldora. Abreu and Hayley are both NASCAR Next alumni. Brett Moffitt finished a career-best third at Pocono in the No. 13 Red Horse Racing Toyota, following up 17-year-old Jake Griffin’s fourth-place showing at Eldora. Timothy Peters trailed Moffitt in fourth. Moffitt has been strong in his two starts with RHR this season. He started the Kentucky race second before engine trouble relegated him to 31st. Peters sits sixth on the NASCAR Camping World Truck Series Chase Grid, 31 points ahead of Ben Kennedy on the cutoff line. On the season, he claims three top-five and eight top-10 finishes. Four races remain for winless NASCAR Camping World Truck Series drivers to lock up the final three berths for the Chase. The Chase Grid shape up as follows: William Byron (5 wins), Matt Crafton (2 wins), Johnny Sauter (1 win), Christopher Bell (1 win), John Hunter Nemechek (1 win), Daniel Hemric (31 points ahead of Ben Kennedy on the cutoff line), Timothy Peters (+31), Cameron Hayley (+0, tiebreaker). The first six drivers out are Ben Kennedy (-0, out via tiebreaker), Tyler Reddick (-1), Cole Custer (-5), Ben Rhodes (-18), Rico Abreu (-33) and Spencer Gallagher (-35).